Authorities in Vietnam seized thousands of snakes that were smuggled into the country on a flight from Thailand, officials said Friday. Thousands of nonvenomous rat snakes were shipped as cargo in 60 boxes on a Vietnam Airlines flight from Bangkok to Hanoi's Noi Bai airport Thursday, said airline spokesman Trinh Ngoc Thanh. Thanh said the shipment had been declared as live fish. Many of the snakes, which were surrounded by plastic filled with ice water, died, said Nguyen Ba Oanh, director of the Wild Animal Rescue Center near Hanoi where the snakes were taken. The official Vietnam News Agency reported Friday that the snakes, which are protected animals, may have been en route to another country. 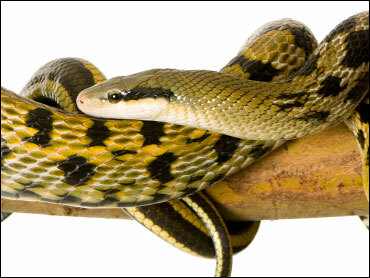 Last month, Vietnamese authorities also found 1,540 pounds of dead snakes on a Thai Airways flight from Bangkok. Thanh said the incidents indicated a problem with cargo inspection at the Bangkok airport. "We plan to send a letter to the Bangkok airport authorities urging them to enhance inspection to avoid this incident from happening again," Thanh said.